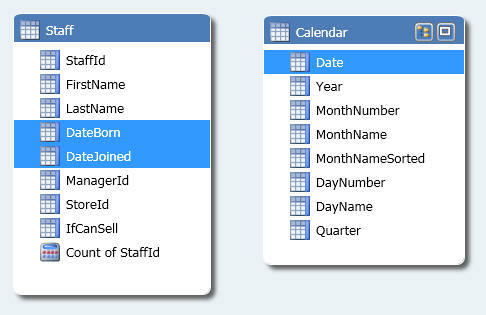 Suppose you want to summarise staff by when they were born and when they joined, using the two date fields shown selected. How can you do this? For example, there are 4 members of staff who were born in 1995 and who joined the MAM company in 2011. I'll first show how to set up this model, then how to solve this problem. 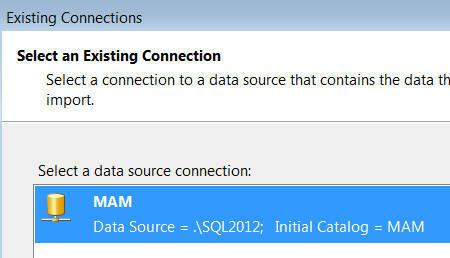 Change the stored procedure to start much earlier, recreate it and re-run it, as described here. 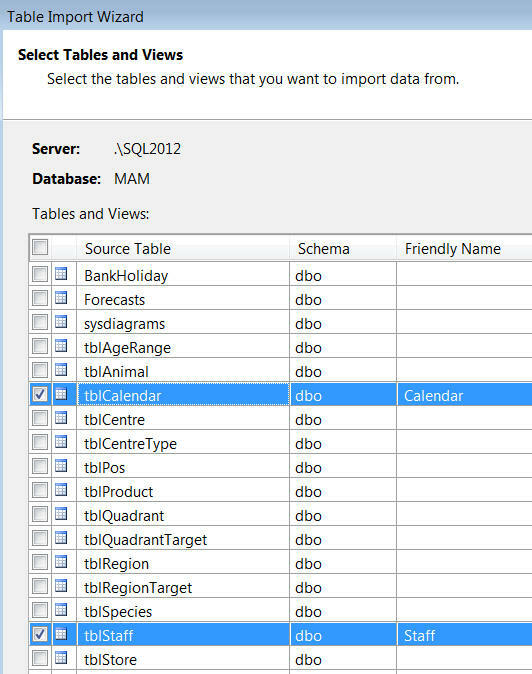 Import the tblStaff and tblCalendar tables, and give them friendly names as shown here. A measure to count the number of staff for any pivot table cell. 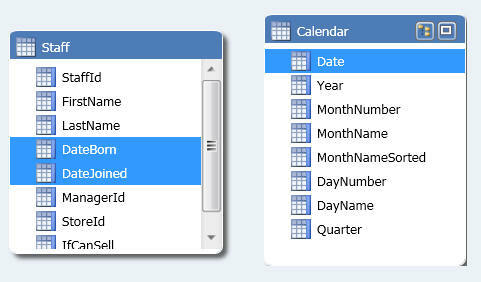 The problem comes now: which of the two date fields do you join to the calendar date column? 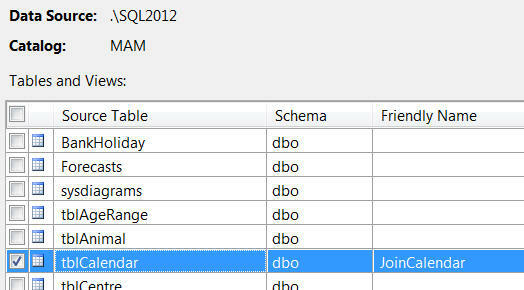 You can't join by both dates, otherwise you won't get any data in your pivot table. 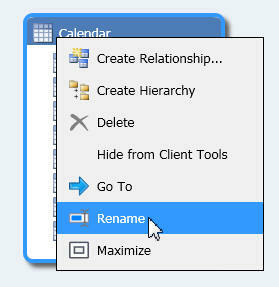 Rename the calendar table you've imported (let's say it will link to the birth date, so we'll call it BirthCalendar). 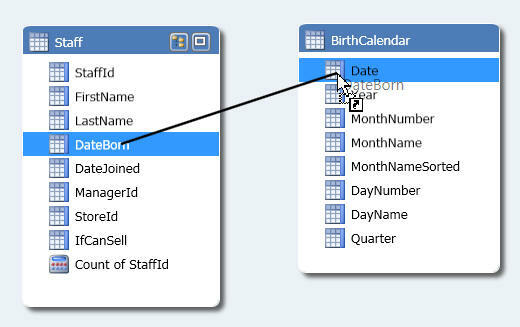 Drag the birth date column onto the calendar date column. 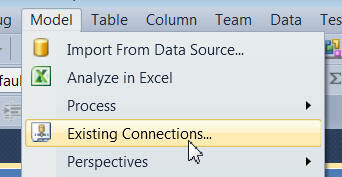 The menu option to view your model's connections (there's a tool to do the same thing on the SSAS toolbar). I had the foresight to rename mine as MAM. Here we've used the friendly name JoinCalendar. Creating the relationship to find the year in which people joined. It's not obvious that the Year on the left is the birth year and the Year at the top the joining year, so it might be an idea to go back and give your calendar columns less ambiguous names. The only tweak I've done is to change the sort order for the two years. Purists may not like this approach, since it involves storing the rows in the calendar table multiple times (once for each date). However, it's easy to understand and use, and memory is rarely that much of a constraint. 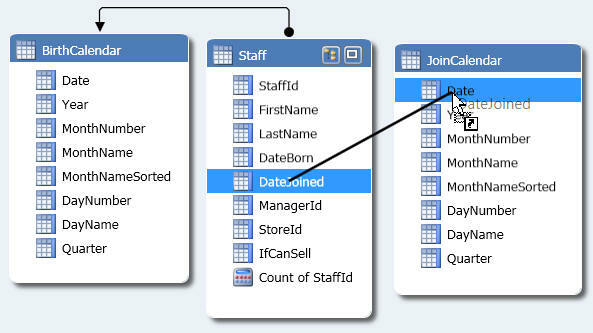 For those who don't like the concept of importing multiple calendar tables, try the final part of this blog, which shows how to create multiple relationships instead.